With sales of $32.7 billion in 2012, Continental is among the leading automotive suppliers worldwide. As a supplier of brake systems, systems and components for powertrains and chassis, instrumentation, infotainment solutions, vehicle electronics, tires, and technical elastomers, Continental contributes to enhanced driving safety and global climate protection. Continental is also an expert partner in networked automobile communication. Continental currently has approximately 173,000 employees in 46 countries. 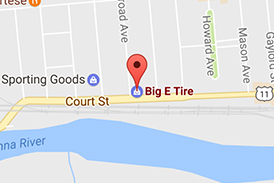 Get A Quote Today on Continental Tires at Big E Tire and Auto – Browse Continental Tires Now!